There are 3 simple steps to complete EarlyIQ’s verification process, and it takes only about 10 minutes. Maintaining investor confidentiality and security are paramount in addition to accuracy and efficiency when selecting a provider for Accredited Investor Verification. Our entire process is conducted online, on our secure, credentialed, and encrypted platform. Here's what investors can expect when using EarlyIQ. Step 1. Enter your personal information. This step is to simply register by entering your name, address and email. A key step in all of our verification procedures is to ensure proper identity of the individuals involved. 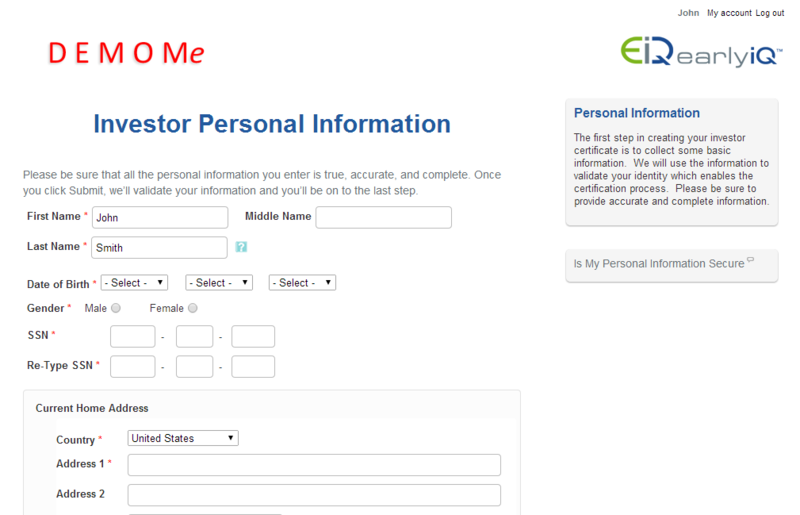 This step substantially mitigates the risk associated with identity fraud - fictitious or stolen identities and “friendly fraud.” During this first step, investors are presented with a series of questions which enable EarlyIQ to ensure that all subsequent steps the Accredited Investor Verification process are performed with confirmed identities. 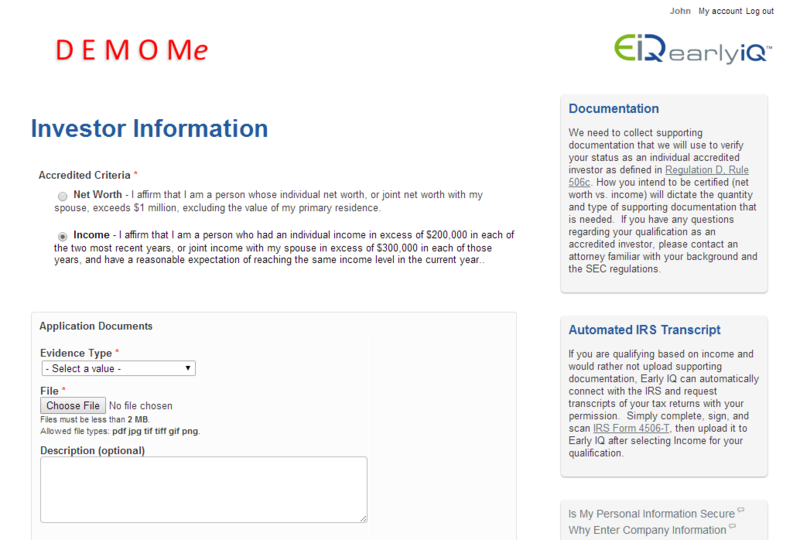 EarlyIQ is the only online Investor Verification service to offer this critical step. Net Worth or Income Qualification? Reg D, 501 defines two primary ways in which an individual is considered an Accredited Investor. 1) Net Worth. To qualify on net worth, an investor must have a net worth over $1 million, either alone or together with a spouse (excluding the value of the person’s primary residence). 2) Income. To qualify on net income, an investor must have earned income that exceeded $200,000 (or $300,000 together with a spouse) in each of the prior two years, and reasonably expects the same for the current year. After investor identity has been confirmed and the method for qualification has been selected, it's time to provide supporting documentation that shows sufficient evidence for the chosen method - net worth or income. 2) Letter from your attorney, CPA, registered investment adviser or registered broker stating your qualification as an Accredited Investor. There is no need for you to upload or document all of your liabilities. We'll automatically pull your credit report (using what's known as a "soft pull" meaning our review will not impact your credit score). You only need to report any liabilities not contained in the credit report. And there is no need to document all of your assets, simply provide enough documentation to support your qualification (e.g. current Net Worth of $1 million not including your primary residence). All documents received are reviewed for accuracy, completeness, and timeliness. If any discrepancies are found, those items are noted and the investor is contacted for clarification. In the cases where a letter is provided by the investor as supporting evidence, the EarlyIQ team verifies both the author of the letter and the authenticity of the letter thereby mitigating the risk of fraudulent evidence. Once an investor has completed the application process and has been verified by EarlyIQ, a personal, secure, encrypted certificate and badge are created for the investor. When shared by the investor, the badge is the access point through which the investor's accredited investor credentials are shared. As you see, when clicking on the badge, viewers do not have access to any personal information - including sensitive information such the basis upon which the investor is an Accredited Investor, the types of supporting documents provided, or any personally identifiable information. Unique to EarlyIQ, the verification certificates are dynamically generated, real time. They are not static documents, such as a .pdf. This ensures two critical aspects: currency and authenticity. Static documents can become outdated and are also easily falsified. Viewers of an EarlyIQ certificate in any format other than dynamically generated (e.g. a screen shot of an EarlyIQ certificate) may not be viewing the most current or authentic verification and should proceed with caution. After all supporting documentation is uploaded and the investor has submitted for verification, our US-based analysts go to work. All documents are reviewed for accuracy, completeness, and timeliness. If any discrepancies are found, those items are noted and the investor is contacted for clarification. In the cases where a letter is provided by the investor as supporting evidence, the EarlyIQ team verifies both the author of the letter and the authenticity of the letter thereby mitigating the risk of fraudulent evidence. Once all information has been analyzed and upon successful qualification, the investor is issued an EarlyIQ verification certificate.